Fiat Chrysler Automobiles NV and General Motors Co. have trimmer, high-tech trucks coming this year that will fetch top-dollar prices. For now, the automakers are dialing up discounts on outgoing models. Average incentives on the Ram 1500 pickup reached an eye-popping $7,173 last month, up almost $900 over last year, according to dealer data compiled by J.D. Power and obtained by Bloomberg News. 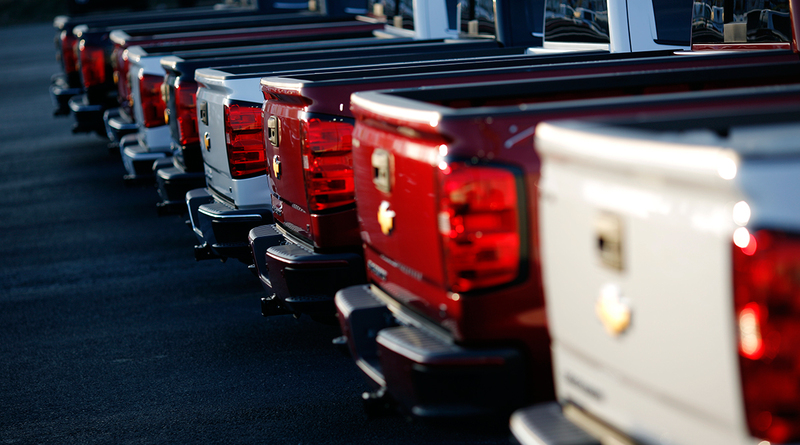 GM jacked up discounts on the Silverado 1500 by almost $2,200 to an average of $6,517. Detroit has room to deal on its full-size trucks, which analysts estimate haul in more than $10,000 in profit per pickup sold. GM, Fiat Chrysler and Ford Motor Co. deliver more than 2 million of them a year in the United States, generating annual revenue of more than $90 billion. The new Chevy and redesigned Ram models are lighter-weight and boast big touch screens and less fuel-thirsty powertrains, and the companies plan to price for that added content once they clear inventory of outgoing pickups from showrooms. Ford, which is offering F-150 discounts on Facebook, increased incentives by $714 to average $4,745 in April. The deals had mixed results in April. Ram’s total pickup sales fell 9.4% last month, while deliveries for Ford’s F-Series line gained 3.5% and GM’s Chevy Silverado jumped 19%. “We are managing our full-size pickup business with a lot of discipline, especially around incentives and pricing,” GM spokesman Jim Cain said. The average price consumers are paying is up almost $170 per truck so far this year, and incentives have risen less than $90 per pickup, he said. The company also sells the GMC Sierra. Fiat Chrysler has said it will produce the old version of its pickup under the name Ram Classic throughout this year as the company ramps up production of the redesigned model. The company will target the outgoing truck toward government and business fleets, as well as consumers looking for a bargain. Pickups are such an important profit driver for the Detroit Three that they are willing to give up some margin to protect market share.